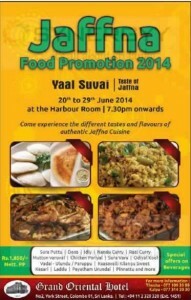 Enjoy your executive lunch buffet on Monday to Friday at The Harbour Room, Grand Oriental Hotel just for Rs. 1,430.00 per person. Smooth piono music to set your meal with your colleagues. The Grand Oriental Hotel, Colombo organised a dinner dance on 31st December 2013 Night to say Bye Bye to 2013 and welcome to 2014. 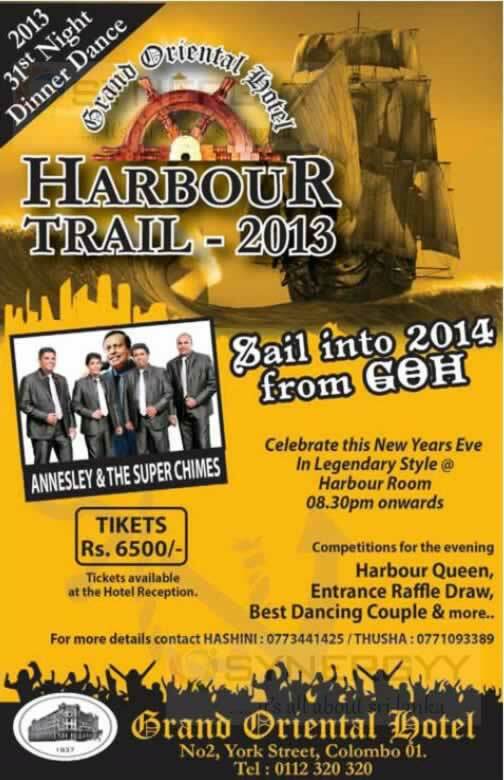 The Dinner Dance named as “Harbour Trail 2013”. Celebrate this New Years Eve In Legendary Style @ Harbour Room 08.30pm onwards, tickets area available now for Rs. 6,500/- or could obtain on the day at Tickets available at the Hotel Reception. The Grand Oriental Hotel brought you a New Promotion of Burger Promo with wide range of Burgers including Chicken, Fish, Beef and Vegi. The promotion valid from 12th to 24th August 2013 from 10.00 am to 5.00pm on Monday to Friday and Saturday 10.00am to 1.00pm. The Grand Oriental Hotel organizes an Romance Night 2013 on 14th February 2013 from 7.30 Pm onwards at Harbour room. Enjoy special complimentary and special event at best price of Rs. 2,500 net per person. The Grand Oriental Hotel offers you the Srilanka Dinner on buffet on every Friday from 7.30 Pm onward with oriental music extravaganza “Peduru Party” at Sri Lankan Restaurant for Rs. 999.00 per person. Again in off season the Its Doughnut Time celebrations at Grand Oriental Hotel, come and go crazy with Tiffin hut from 21st to 24th January 2013 from 10.00 Am to 5.00 Pm. 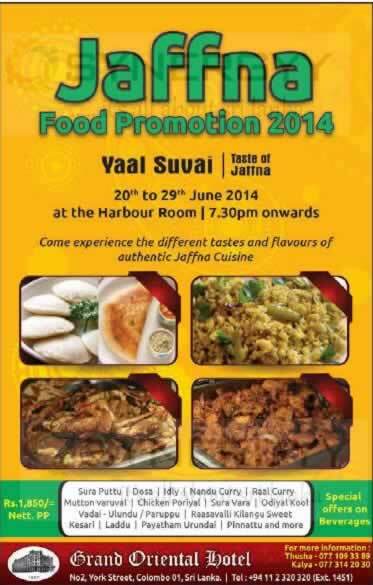 For a change have Hoppers Night with Kottu & Jaffna (Dosa & Wadde) Corner at Grand oriental Hotel. The special Jaffna Corner available only on Saturday & Sundays from 7.30 Pm onwards to serve you delightful hoppers. see below image for more information. 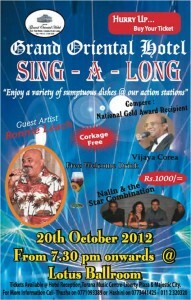 The Grand Oriental Hotel Srilanka Conducted the Sing A Long on 20th October 2012 at Lotus Ballroom from 7.30 Pm Onwards. 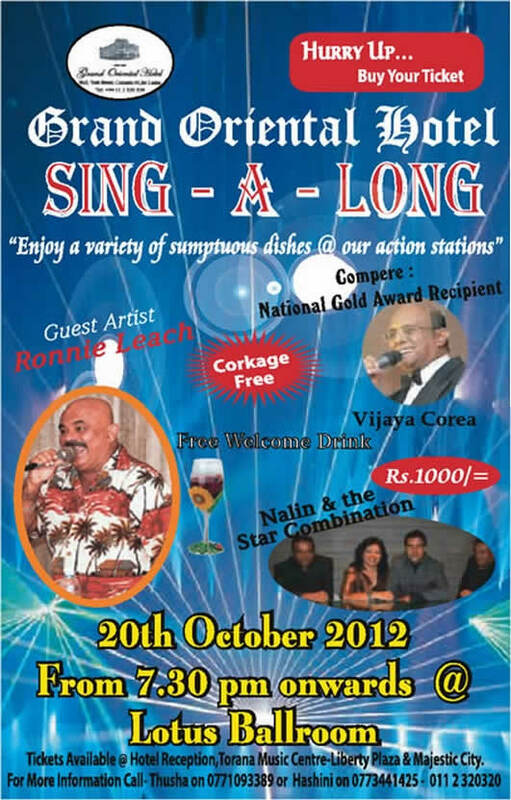 Enjoy a verity of sumptuous dishes at action station by Ronnle Leach, and Nalin & the Star Combination with Comparer of Vijaya Corea. Buy your Ticket today for Rs. 1,000.00 from Hotel reception, Torana Music Center, Liberty Plaza & Majestic City. The Grand Oriental Hotel Srilanka Conducted the Singapore Food Festivals from 8th to 14th October 2012 at harbour Room from 7.30 Pm Onwards. Don’t Miss the Delicious Singapore foods and Spice food; tomorrow 14th October last day for the opportunity to don’t miss it.